My summer internship at the Organization of American States (OAS) was rewarding for many reasons. I am passionate about working in development and migration policies and projects in the Americas. 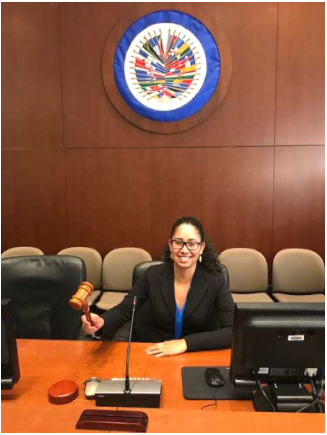 The OAS has increased my expertise in those fields and has given me the opportunity to meet amazing people from different countries. My internship was based in the Department of Public Security within the Secretariat for Multidimensional Security. I researched policies, programs, and publications on the prevention of violence and crime in the region. I updated the Inter-American Network for Prevention of Violence and Crime with daily articles and learned about the relation between public security and international development. I reviewed forms submitted by the National Authorities in the area of trafficking in persons (TIP). These forms included the OAS Member States laws and best practices to combat the heinous crime of TIP. The forms also included information about TIP within their countries. I sorted through this information which will be used for the upcoming database on TIP in the region. This database will include the contact information of government officials and institutions, nongovernmental organizations, and activists that are working against TIP; hotlines for victims and witnesses of the crime; information on resources available for victims; and documents regarding TIP. The internship has allowed me to meet United States Foreign Service Officers, international civil servants, employees of the Organization of American States, and people from all over the world who work in development, humanitarian assistance, and diplomacy. This opportunity has been rewarding and I am grateful for the experience. Kirssy Gonzalez is a graduate of SU’s Maxwell School and College of Arts and Sciences. She has earned both a MA in International Relations (MAIR) from Maxwell and a Pan-African Studies degree from Arts and Sciences. She also formerly interned at International Organization for Migration — the UN Migration Agency — in Geneva during the summer of 2017.